MAN Truck & Bus UK Ltd secures a £53m contract to help modernise the British Army’s Logistic Vehicles Fleet. MAN Truck & Bus UK Ltd has entered into a contract with the UK Ministry of Defence (MoD) that will see the modernisation of part of the British Military’s fleet of logistic vehicles. The project will deliver the British Military a new pallet and container loading system. A total of 382 retrofit kits for the Enhanced Pallet Loading System, or EPLS, will be supplied and integrated into the tried-and-tested HX trucks of Her Majesty’s Armed Forces; vehicles that MAN delivered to the MoD under a separate contract signed in 2005. MAN is working with its strategic partner, Rheinmetall MAN Military Vehicles Austria (RMMV Ö) to deliver this key strategic project; with RMMV Ö providing the technical solution and the EPLS Mk 3 System that will then be installed on the donor vehicles by MAN UK Ltd. RMMV Ö’s subcontract is worth over €43 million. Shipping and retrofitting is to be completed by the end of January 2021. During the period 2005-2013, the British Army procured more than 7,500 HX logistics vehicles from MAN. 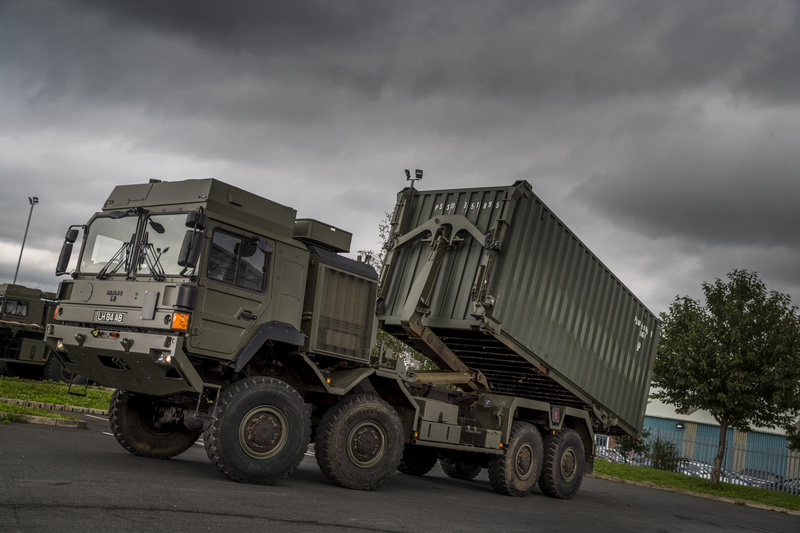 Regarded as the backbone of the Royal Logistics Corps, this “military off the shelf” family of vehicles has proven highly effective, however the growing demand for transport solutions for containers has continued to rise. Based on operational experience, MAN, RMMV Ö and the UK MoD officials drew up a plan to retrofit existing flatbed vehicles with a hook lifting system. The modernisation programme is a partnered team solution. MAN is undertaking overall project management responsibility for the programme and will undertake the conversion of the vehicles. RMMV Ö has responsibility for supplying the conversion kit, which will be produced by the company’s plant in Vienna, Austria. The hook loading system is made by HIAB, a company Rheinmetall has cooperated with in many comparable international projects, e.g. in Australia, Norway, Sweden and New Zealand, and the solution is a COTS Product (“Commercial Off the Shelf System”). The project is a compelling example of the close partnerships MAN and RMMV maintains with its customers; encompassing post-design service throughout the product’s entire lifecycle. It also highlights the prolonged supportability of the HX family of vehicles, which sets the global standard for robustness, mobility, performance and both flexibility and modularity.